The GT teams arrive at Silverstone this week for round two of the 2007 FIA GT Championship and the Scuderia Ecosse team head into the event with a formidable driver line-up.With Tomas Enge still sidelined the team will field Tim Mullen and Andrew Kirkaldy in the GT2 class Ferrari F430GT no.62 and 1992 FIA Formula One World Champion, Nigel Mansell, will join 2006 British GT Champion, Chris Niarchos, in Ferrari no.63. Nigel Mansell: "I’m very much looking forward to driving the Ferrari again this weekend. The first run at Knockhill a few weeks ago was good but I’m keen to see how we perform at Silverstone. The circuit has been good to me over the years so I hope we can have a good race and put on a great show for everyone who comes down to watch us." Chris Niarchos: "I’m very excited about the Silverstone race and I feel very privileged to be driving with Nigel. Three days with Nigel Mansell is like a lifetime with any other driver in terms of opportunities to learn so I will make sure I soak it all up. We may come from vastly different backgrounds in racing terms but we are both there to do our best for the team so I hope to take the fact I am driving with an absolute legend in my stride and do the best job I possibly can. I can’t wait." Andrew Kirkaldy: "We go into Silverstone off the back of a very thorough and productive test in Estoril. We made progress in many areas not least the tyres; Pirelli are pulling out all the stops to help us win this championship. I was really pleased to see Chris driving so well and I know he’s really looking forward to driving with Nigel. It will be interesting for me to drive with Tim this time out; we both know the circuit well and we are going there to win. It’s great to have Nigel on the team too. He has vast experience and a lot of good ideas about the car so I can’t wait to get stuck in!" Tim Mullen: "I think the combination of myself and Andrew will be a strong one. We’ve been working hard all week in Estoril with Pirelli to find the right tyre for Silverstone and we’re feeling confident for the race. It’s great that Andrew is able to fill in for Tomas as we already know each other well so we don’t need any time to adjust to one another. I think we’re on for a good weekend although it’ll be strange to race against the guy I used to watch on the TV when being a racing driver was still a dream. Strange…but cool!" Stewart Roden, Scuderia Ecosse team principal: "Well, here we go! This is the part where the talk stops and the action starts! We’ve just had a great test at Estoril where we made some good improvements to the whole package. Pirelli want us to win and have shown huge enthusiasm and support; it was a great benefit to have the opportunity to test like this early in the season. 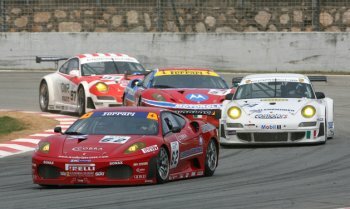 The #62 Scuderia Ecosse Ferrari F430GT in GT2 class race action during the opening round of the 2007 FIA GT Championship, held at Zuhai in China last month. 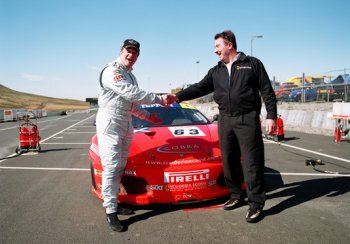 Nigel Mansell with Scuderia Ecosse Team Principal Stewart Rodin at Knockhill on 5th April when the former F1 World Champion got his first taste of the Ferrari F430GT. "We’ve been bowled over by the reaction to the news that Nigel is joining us at Silverstone. It’ll be a busy weekend for us but we want to do a good job for Nigel and of course for our championship campaign so we’ll be getting our heads down and working hard next week." Scuderia Ecosse is a Championship-winning Ferrari GT racing team, based close to Edinburgh in Scotland. In 2007 the team is competing in the FIA GT Championship and the Le Mans 24 Hours. In three short years Scuderia Ecosse has gone from being a brand new GT team to becoming two-time British GT Champions, race winners in the Le Mans Series and the FIA GT Championship and podium-finishers at the daunting Le Mans 24 Hours. Round two of the FIA GT Championship (The Royal Automobile Club Tourist Trophy) takes place at Silverstone on Sunday 6 May 2007. The FIA GT cars are first out on track on Saturday 5 May at 0900hrs for an 80-minute practice session. A second 80-minute session takes place at 1325hrs before the 1745hrs qualifying session. There is a 30-minute warm up session on Sunday morning at 0900hrs before the two-hour race begins at 1200hrs. The FIA GT Championship, now in its 11th season, is the leading international series for GT Cars – dream sports cars designed for the road and adapted for the track. 2007 will see nine two-hour races and the 24 hours of Spa. Reserved for private professional teams, brands represented include Aston Martin, Corvette, Ferrari, Lamborghini, Maserati and Porsche. The drivers are an eclectic mix of former F1 drivers, sports car specialists, young drivers out of single-seater’s and talented amateurs, for whom the Citation Cup for GT1 drivers is reserved. In 2007 the Championship will visit a variety of circuits beginning in Zhuhai, China, before returning to Europe visiting a number of classic Grand Prix circuits including Silverstone, Monza and Spa-Franchorchamps, as well as championship favourites Oschersleben, Brno and Adria, and for the first time Bucharest on a specially built city centre street circuit, designed by Herman Tilke, the F1 circuit designer. Also new to the Championship is Nogaro, France, with the season finale returning to Zolder in Belgium.